Red Planet Orchestra is the UK based duo of Vincent Rees and Peter Smith, who were the same musicians who created the T30 Control albums Blade Of The Sun (2003) and Hollow Earth (2006). In my review of Blade Of The Sun I summarized it as appealing to fans of early 70’s German electronica, ambient/soundscape music, and all things SPACE. 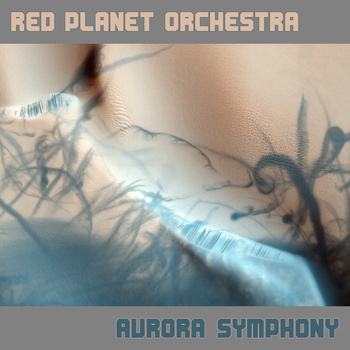 Red Planet Orchestra are much more subdued than T30 Control, and the Aurora Symphony title of their first album describes precisely what it is… a symphony in space. An ambient wave of shimmering electronic string section make up the First Movement. This is characterized by a single theme that changes very little, though I sat as quietly and blissfully enraptured as if I were experiencing it in a concert hall (which is exactly how this music made me feel). The theme continues with the Second Movement, though the pace picks up ever so slightly. The ambient string section becomes a wee bit fuller and is joined by whispery electronic wind instruments, a heavenly choral feel, and a detectable melody begins to gradually evolve. The short Third Movement introduces more distinct voices, and the music takes on an avant-garde hue with the interesting way in which these voices are placed within the symphony. Requiem For Aurora transitions to a darker and more intense mood for the finale. In summary, this is a beautiful album and Red Planet Orchestra have demonstrated how much can be communicated with so little. The music evolves gradually and subtly while packing an emotional punch throughout. Headphones and undivided attention essential.